The Syneron eLaser laser machine is an extraordinarily versatile cosmetic laser system that can tackle a wide variety of procedures from hair removal to skin rejuvenation to leg and facial veins. Because of its advanced technology, this model can also treat minimally pigmented hair and skin colors that many other systems cannot. 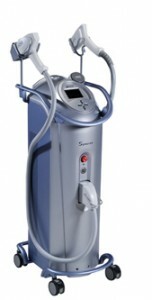 Like all the Syneron cosmetic laser systems, the Syneron eLaser model features the company’s exclusive elos technology that combines bi-polar radio frequency with optical laser or light energy to achieve exceptional results with less patient downtime and side effects. To get more information on this model or to request a no obligation Syneron eLaser laser machine price quote, contact us right now. The Syneron eLaser laser machine is a very complex system, so while you can save money on the purchase of a pre-owned machine, you also want to make sure you are getting quality equipment that will provide years of reliable service. You can get all that from SunrayLaser.com, where you can buy a used Syneron eLaser laser machine at up to 60% off the original retail cost. Unlike many other companies, we are happy to provide upfront pricing information on any pre-owned cosmetic laser system we sell. To get a no obligation price quote on a Syneron eLaser laser system, all you need to do is fill out the contact form below.